FC Barcelona president, Josep Maria Bartomeu, explained the details of the trip he made to Holland to close Frenkie de Jong’s transfer from Ajax. 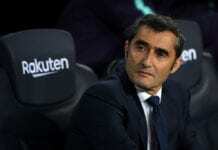 In FC Barcelona’s history, there have been several tales of players who are sought after by the club and their president is the one who has to make the effort to seal the deal, this is exactly what happened between Josep Maria Bartomeu and Frenkie de Jong. In the past, there have been several presidents who have been forced to close the deal themselves for players who came to change the club’s history. The case of Ronaldinho and how president Joan Laporta travelled to Paris when Manchester United was also bidding for the Brazilian, is perhaps the case that resembles De Jong’s the most. In fact, there are many similarities for both deals that got closed and we are going to break them down for all of you. First of all, Frenkie was one of the most coveted midfielders in the world and a player who seems destined to become one of the best in his position for the next decade. The youngster’s versatility with the ball at his feet is something that very few players in the world have, something that serves a club like Barcelona perfectly for many different roles by the time he starts playing for them next summer. This was the same case with Ronaldinho, as the Brazilian was easily one of the world’s biggest prospects for the next five years and any club that landed his contract would instantly become a title contender for all competitions. Sir Alex Ferguson knew this perfectly and he was doing everything in his power to convince him, but Ronaldinho was good friends with Sandro Rosell and Joan Laporta, which is why he eventually decided to play for Barcelona. Frenkie de Jong’s situation was strikingly similar, as he was coveted by not only Barcelona but Manchester City and Paris Saint-Germain as well. Both of these clubs perhaps had more money than the Catalan giants but they both lacked the tradition and history that ties very close to the Dutch players, but Josep Maria Bartomeu knew that he had to make a trip to Amsterdam in order to convince both the player and his father. The president knew that he would have to use his “Johan Cruyff” trump card and appeal to their admiration for the Dutch legend, this was the major selling point that eventually convinced the player that Barcelona was the best possible option for him. Bartomeu just offered an interview to Cadena Cope where he discussed several topics, but the most important one was the way in which De Jong’s transfer took place and how he played a role in the whole deal. “When there is a transfer of an important player happening, I love getting involved. Back in 2010, I went to Liverpool to sign Mascherano,” said the president during the interview. How quickly will Frenkie de Jong adapt to FC Barcelona after he arrives? Please share your opinion in the comment section down below. Previous articleIs Vinicius Junior ready to take Bale’s place in Real Madrid first team?